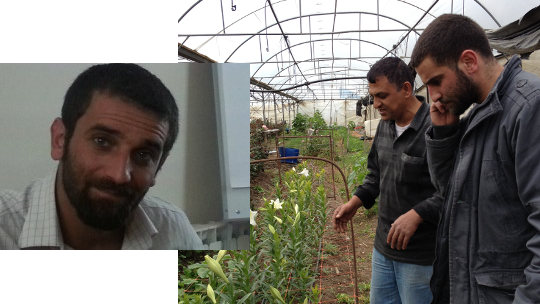 In order to provide our members with more interesting details about the recent partnership implemented with the Microfinance Institution ACAD (Arab Center for Agricultural Development) in Palestine; here is a great interview introducing our new local correspondent Sameer Khraishi, working in ACAD. Hello Sameer, can you start by introducing yourself and your background? My name is Sameer Khraishi, I’m 29 years old and it’s been 4 years now that I have been working with ACAD. I have a master degree in computer sciences and before ACAD I was working in the media and IT Unit in a democracy and workers’ rights institute. What is your position in ACAD? After this first experience, I had the opportunity to join ACAD as an IT officer for 6 months. However, at this point I did not want to continue as an IT specialist. I thus decided to change my career path by specializing in microfinance. I started to train myself by reading books and articles. Then, with the help of my colleagues, I received some trainings on microfinance and management beside my position of IT officer. It was an intense period of education for me. After one year and a half working with ACAD, I managed to join the microfinance department. And after three years, they offered me a position as a compliance officer which consists in checking loans, legal documents and other official documents regarding each loan is well consistent. Now, I am still working as a compliance officer, but I am also the direct assistant of the Chief of Operations at ACAD! What do you like the most in your job? Can you describe one typical day at work? I will still try to describe the different parts of my days. I start working at around 8am and I spend the first few hours to check the loans sent by the loan officers everyday to the headquarters: it represents 10 to 20 loans daily. This task is also about checking all the legal documents, the repayment periods and to make sure loan officers made no mistakes with each loan. After that, I send the loans checked to the credit manager or the financial manager for a second check. Sometimes I get to have meeting with companies or people for potential or existing partnerships, like Elsa and Thomas from the Operation Team of Pi Slice - MicroWorld last March. As part also of my position, I sometimes do sudden checks or visits to random field officers in one of the eight ACAD branches. During this process, I pick 2 or 3 loans and I analyze them. I talk with the borrowers, and ask them several questions regarding their projects and needs. Then, it happens that I solve problems or answer questions about our loan program and our products. How went the recent integration of ACAD with the Pi Slice - MicroWorld team? It went very well, the communication between ACAD and Pi Slice - MicroWorld was really easy and getting to know Elsa and Thomas was a great pleasure! We both share the same passion towards developing microfinance as well as to help reducing poverty: it was a connection between us. What this partnership with Pi Slice - MicroWorld brings to ACAD? It is a good advantage for us to develop our international visibility because our activities are limited to the West Bank and Gaza in Palestine and we do have a lot of success stories and implementations to share with the world. In the same spirit, this partnership with Pi Slice - MicroWorld allows us to highlight our successful organization’s work, and to send the message to the world that we are well developing and implementing good practices in the microfinance sector in Palestine. It is a really good strategic partnership for an extraordinary business. Except this international exposure, we think that this partnership gives value to our client network by publishing pictures and stories about their project of life. Through this platform, we can share with the world the value in starting a project despite of the poor situation of the micro-entrepreneurs in this region. Personally, what do you think about this collaboration? On the online platform, I’ve read that the goal was to engage more actors in the process of microfinance: I like this idea! What I appreciate is that Pi Slice - MicroWorld is providing a way for individuals to be involved in the development sector, and do not limit microfinance to microfinance institutions. Trying to touch people who are not concerned by microfinance and engage them in financing projects is a really great idea and behavior. For me, this partnership will increase our social responsibility: I see it finally more as a social partnership than a financial one. Discover all the pictures of ACAD integration : click here! The transfer and hosting of funds on MicroWorld are made via the payment service solution MANGOPAY, edited by the company Leetchi Corp SA, as approved issuer of electronic money authorized by the CSSF. MicroWorld edited by ABC Microfinance is registered as Intermediary in Crowdfunding to ORIAS under the n°17005376.